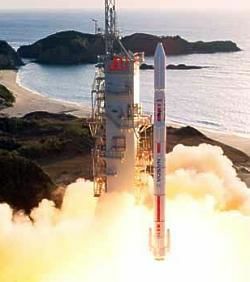 Japanese all-solid orbital launch vehicle. Lower cost alternate to the original J-1 design. Uses the SRB-A of the H-2A vehicle as the first stage, the second and third stages of the J-1, with updated avionics. Status: In development. Payload: 850 kg (1,870 lb). Thrust: 1,800.00 kN (404,600 lbf). Gross mass: 91,500 kg (201,700 lb). Height: 26.20 m (85.90 ft). Diameter: 2.50 m (8.20 ft). Apogee: 250 km (150 mi). LEO Payload: 850 kg (1,870 lb) to a 250 km orbit at 30.00 degrees. Payload: 600 kg (1,320 lb) to a 407 km 51.6 deg orbit. Stage 1. 1 x H-2A SRB-A. Gross Mass: 76,400 kg (168,400 lb). Empty Mass: 10,400 kg (22,900 lb). Thrust (vac): 2,250.000 kN (505,820 lbf). Isp: 280 sec. Burn time: 101 sec. Isp(sl): 230 sec. Diameter: 2.50 m (8.20 ft). Span: 2.50 m (8.20 ft). Length: 15.20 m (49.80 ft). Propellants: Solid. No Engines: 1. Engine: SRB-A. Status: In production. Comments: Shorter monolithic motor using filament-wound case technology from Thiokol. Version for J-1 has 1,000 kg less propellant and 1,200 kg less empty mass. Stage 2. 1 x J-1-2. Gross Mass: 12,800 kg (28,200 lb). Empty Mass: 2,400 kg (5,200 lb). Thrust (vac): 524.802 kN (117,980 lbf). Isp: 282 sec. Burn time: 73 sec. Diameter: 1.40 m (4.50 ft). Span: 1.40 m (4.50 ft). Length: 2.70 m (8.80 ft). Propellants: Solid. No Engines: 1. Engine: M-23-J. Other designations: M-23. Status: In production. Comments: Version for J-1 F2 has 300 kg heavier empty mass. Stage 3. 1 x J-1-3. Gross Mass: 3,600 kg (7,900 lb). Empty Mass: 300 kg (660 lb). Thrust (vac): 132.085 kN (29,694 lbf). Isp: 294 sec. Burn time: 87 sec. Diameter: 1.50 m (4.90 ft). Span: 1.50 m (4.90 ft). Length: 2.70 m (8.80 ft). Propellants: Solid. No Engines: 1. Engine: M-3B-J. Other designations: M-3B. Status: In production. Family: all-solid, orbital launch vehicle. Country: Japan. Stages: M-23-J, M-3B-Mu, SRB-A. Agency: Nissan.